Lightweight, maneuverable, and surprisingly powerful. STIHL has combined its vast experience of cut-off saws with its enduring Lithium-Ion battery technology to power the new TSA 230 cut-off machine. With no fuel or emissions its battery power makes it suited to use indoors and in enclosed spaces; it is also very quiet running. 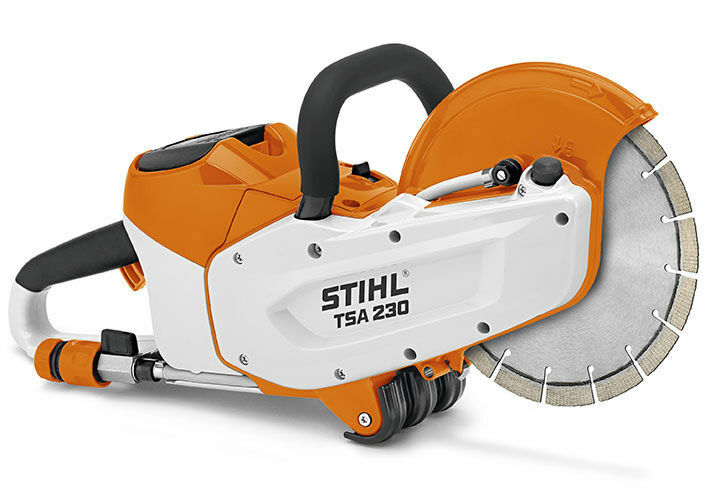 Cutting neatly and swiftly up to 70mm deep, the choice of STIHL abrasive wheels gives the new model the capacity to cut steel and metal pipes, through to concrete, bricks and roof tiles. Very easy and comfortable to handle. For various applications in civil engineering. Ideal for builders, roofers, gardeners and landscapers. 36V. STIHL recommends the use of the AP 180 battery for maximum performance. Magnesium guard The cutting wheel guard is made from a light and durable die cast aluminium. STIHL electric motor (EC) The STIHL electric motor (EC) is extremely energy efficient, lightweight and compact. It runs quietly, generates very low vibrations and does not require servicing.